We lingered at Lagoon Cove, chatting with the owners, caretakers and boat crews. Later yesterday a Selene named DanCin Dream docked at Lagoon Cove. 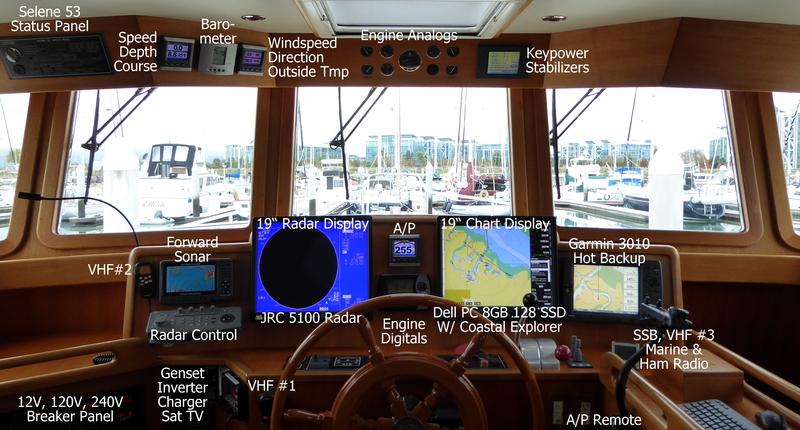 Owners Dan and Cindy have cruised their boat up the Pacific Coast from Dana Point, CA on their way to Alaska. We'll probably be seeing more of them this summer. 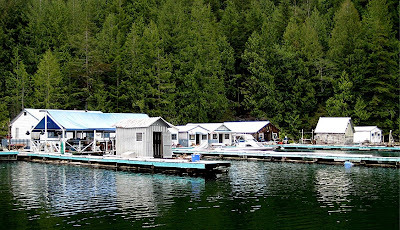 Pat, one of the Lagoon Cove caretakers, is a ham radio operator and runs the 80 meter boaters net. She gave us some tips for our cruise north. 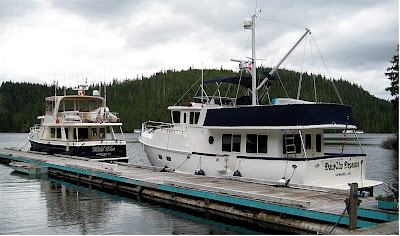 Today's destination is Shawl Bay, a "marina" in the Broughton Islands that gets us closer to Port Hardy. 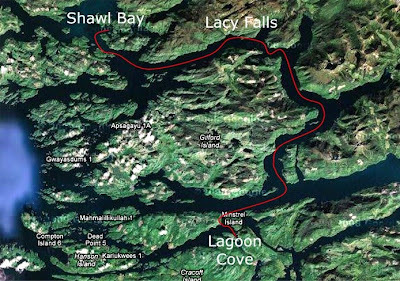 It's about a 3-hour cruise counter-clockwise around Gilford Island, past pretty Lacy Falls. The barometer is lower at 1005 millibars, but has leveled out for now. High wind warnings are up for Queen Charlotte Strait, QC Sound and the west coast of Vancouver Island, so we will be getting that wind soon. About 30 minutes into our cruise, we spotted a large Black Bear on the southeast corner of Gilford Island in a clearing. She noticed us but didn't skip a bite! 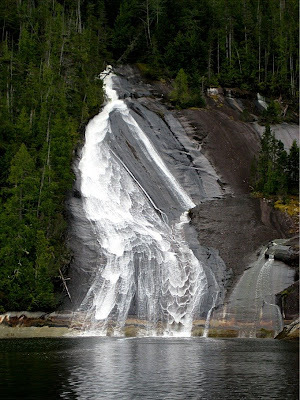 In the middle of Tribune Channel we came across Lacy Falls named for the fall of water down a granite face, creating a lacy look. After a nice day of easy motoring we came to Shawl Bay "marina". Rob the caretaker is the family's 4th generation operating out of Shawl Bay and grew up here. His great grandfather was a logger in the Bay and established the "marina". 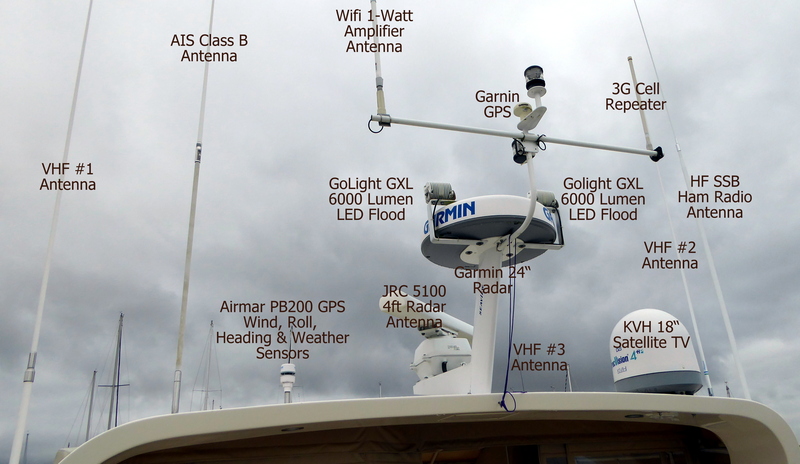 The entire facility is built on floats. The marina floats are large logs chained together. The breakwater is made up of the largest logs chained together end-to-end. 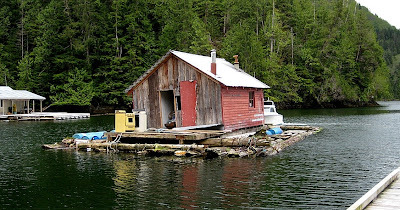 The house floats, store float, storage floats, shed floats, gazebo float, and covered patio float are tied to the dock floats. The dock floats, also built of chained logs, are anchored to the ocean floor by giant chain. Rob told us we were the first boat to arrive this season. They usually don't open until July 1st. During the busy summer season, pancake breakfast is served each day on the patio for the guests. When we arrived, Rob was in the middle of reconfiguring the marina for the season. Bunkhouse for the summer staff gets relocated. Shortly after we arrived our new friends from the Selene 47 DanCin Dream made it into the Bay. We had a fine chat over California Pinot and Wisers, Crown and Bowmore whiskey blends. 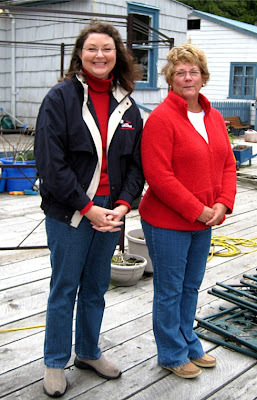 Admirals Cindy and Pat compared cruising notes and their Captain's tendencies. The weather is getting interesting again and the barometer is beginning to fall further. We'll see what happens tomorrow.